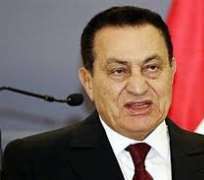 A court in Egypt has dropped charges against former President Hosni Mubarak over the killing of 239 protesters during the 2011 uprising against him. The Cairo court erupted in cheers when the judge said Mubarak should not have been a defendant in the case as the charges against him were added late. Charges against seven senior ex-officials were also dropped. The decision could be appealed. Victims' relatives expressed dismay and frustration. The former president, 86, is serving a separate three-year sentence for embezzlement of public funds. He is currently being held in a military hospital, and is expected to serve at least a few more months of this sentence. Mubarak, his former interior minister, Habib al-Adly, and six others had been convicted of conspiracy to kill and were sentenced to life in prison in June 2012, but a retrial was ordered last year on a technicality. In all, about 800 people are thought to have been killed as security forces battled protesters in the weeks before Mubarak resigned on 11 February 2011. However, the court documents at the retrial related to the deaths of 239 people and injuries sustained by 1,588, across 11 of the country's regions. As well as the murder charge, Mubarak was cleared of a corruption charge involving gas exports to Israel. His sons, Gamal and Alaa, were also cleared of separate corruption charges by the same court on Saturday. As supporters cheered the verdict, his sons and co-defendants stooped down to kiss his forehead.